There's no questioning why couples and families return to Tybee Island vacation homes year after year. This destination provides the sunshine, sea air and relaxation we all crave. Life is simply easier here. One of the secrets to making the most of your stay in one of America's most popular holiday destinations is choosing one of the Tybee vacation rentals located near all of the best attractions in the area. Southern Comfort is one of those properties. What makes Southern Comfort especially remarkable is that it is one of the rare Tybee Island vacation rentals to have its own private pool. What's more, the home is just steps from the beach! Get ready to dip your toes into a world of comfort, beauty and relaxation when you book a stay at Southern Comfortt. Come step inside one of the most inviting Tybee vacation rentals you'll ever find. Southern Comfort should not be skipped over by anyone looking for Tybee vacation rentals that can accommodate 10 guests. This home boasts 3,400 square feet of space to use and enjoy during your stay. It features four bedrooms and four bathrooms. The interior of Southern Comfort can only be described as cool and comfortable. The living room features comfortable couches where an entire group can relax and chat at the end of the day. The room also features a flat-screen television. Touches like ceiling fans, recessed lighting and tasteful décor finish off the look of the room perfectly. There is a dining nook with a full-sized table positioned in the back of the main living area. Guests can enjoy their meals while taking in views and breezes from the large window located in the dining nook. The home’s modern kitchen offers country touches that make it feel exceptionally welcoming. The kitchen features fresh white cabinets, updated countertops and new appliances. Guests can make use of the kitchen's refrigerator, stove and dishwasher while staying in the home. Extras like a coffee maker, microwave and toaster ensure that guests can prepare all of their favorites. A second living room on the second floor provides a relaxing space to enjoy natural sunlight and exterior views. This second living room has a large glass door that leads out to the home's deck. It's time to take a look at the sleeping accommodations inside one of the top Tybee Island vacation homes. The four bedrooms inside Southern Comfort is classic and comfortable. Guests can look forward to a mix of stately four-post beds, wicker beds and bunk beds when selecting their rooms. All of the rooms come with convenient touches like dressers, closets and ceiling fans. The home's four large bathrooms ensure that nobody will be left waiting around to take a shower in the morning. Guests have a mix of bathtubs and showers to choose from. All of the bathrooms are crisp and updated. The home also features a full washer and dryer. What makes this home one of the vacation rentals Tybee Island GA visitors fall in love with so easily? Southern Comfort is a property that boasts an exterior that induces envy in all who pass by. The home’s stately style and large front porch make it appear like a true Southern dream property. The home's porch is the perfect gathering place. It features comfortable seating where a family or group of friends can gather around for morning coffee or evening cocktails. Beautiful landscaping and greenery bring the property's exterior to life. Of course, it is the home's pool area that is its crowning jewel. Southern Comfort boasts a lovely in-ground pool that is perfect for taking refreshing dips on hot days. The pool is surrounded by a charming brick patio that features a table with an umbrella. Southern Comfort is a property that offers all of the little extras guests need to feel at home when staying at Tybee Island vacation homes. Guests can enjoy private parking when staying at the home. In addition, the home comes with cable and Wi-Fi. There are several flat-screen televisions peppered throughout the home. Touches like outdoor seating make this home a wonderful place to relax and get into a vacation state of mind. A new world of possibilities opens up as soon as you've booked one of the best Tybee Island vacation homes around. You can now live and play as though this destination is your true home. That means being able to see the beach, dine at amazing restaurants and visit coastal attractions whenever you desire. Go ahead and enjoy natural marshes that are given life by the Atlantic tides, chase lighthouses, watch herons glide over glistening dunes and walk along piers that stretch toward the horizon. You will enjoy the fanfare of visiting Tybee Island Beach to relax or jump from the sand to restaurants, bars and shops. Be sure to make room on your itinerary for visits to iconic spots like the Tybee Island Lighthouse, the Cockspur Lighthouse and the Fort Pulaski National Monument. In addition, people love coming to Tybee Island to watch for dolphins and whales. You can also get active on the water with some sea kayaking or boarding. Are you ready to start searching for Tybee vacation rentals that can really bring your holiday plans to life? Book Southern Comfort if you want easy living by the beach! 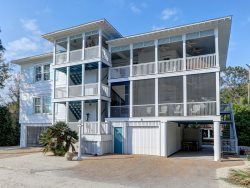 One stay in this stunning and welcoming home will show you why it's one of the vacation rentals Tybee Island GA visitors love returning to time after time. The location is perfect and the blooming honeysuckle vines were an added bonus.